FLOWERY BRANCH, Ga. (AP) — Takkarist McKinley should be next in the line of the second-year breakout players on the Atlanta Falcons‘ defense. He knows he needs to be healthy to make that next step and now he’s trying to move past another shoulder injury. McKinley has had surgeries on both shoulders the last two years — the right following his 2016 season at UCLA and the left following his 2017 rookie season with the Falcons. 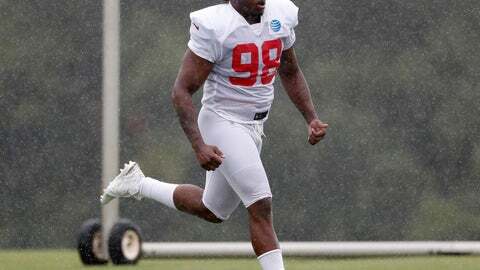 A new problem, a bruised right shoulder, has prevented the second-year defensive end from participating in team drills for most of the start of training camp. He again was limited to individual drills on Monday. The Falcons say there’s no structural problem, but McKinley’s status is uncertain for Atlanta’s preseason opener at the New York Jets on Friday night. Coach Dan Quinn said “Takk” could be cleared for full participation on Tuesday, so he hasn’t been ruled out for the game against the Jets. The Falcons likely will take a cautious approach with McKinley, the 2017 first-round pick whose health is a key to continued improvement by the defense. He had six sacks as a rookie backup in 2017. The Falcons hope he can earn a starting job and emerge as another player who makes significant progress in his second year. McKinley said Quinn has talked with him about how the team’s other projected starting defensive end, Vic Beasley Jr., led the NFL with 15 1/2 sacks in 2016, his second season. Quinn also told McKinley about safety Keanu Neal and linebackers Deion Jones and De’Vondre Campbell earning Pro Bowl honors in their second seasons and defensive tackle Grady Jarrett also breaking out in his second year. “But just because they had a good second year don’t guarantee that I’ll have a good second year,” McKinley said. “The sophomore slump is a huge thing. McKinley actually proved a lot as a rookie. After his six sacks in the regular season, he added two more in the playoffs. Adrian Clayborn led the Falcons with 9 1/2 sacks last season before signing with New England. Clayborn’s departure opens the way for McKinley and Beasley, now a full-time end after spending time at outside linebacker last season, to be the starting ends. Even when he’s not on the practice field, McKinley said he’s preparing for the bigger workload as a starter.